December 4, 1956 is a significant date in rock and roll history. On that single occasion, four performers who received their first encouragement and recorded their first tunes on Sam Phillips’s Sun Records congregated by coincidence at Phillips’s Memphis studio and did some jamming that the wily producer preserved on tape that can be heard to this day. The foursome can still rally a crowd. Even when portrayed by actors. The national touring cast appearing at Wilmington’s DuPont Theatre captures the essence of the classic entertainers they model, especially James Barry as Perkins and Tyler K. Hunter as Presley, and Mutrux and Escott’s musical entertains grandly while providing a little lesson on the origins of rock and roll and the common belief in the music business that the genre would not last through the 1950s. The book of “Million Dollar Quartet” doesn’t go out of its way to be dramatic or poignant. It has some moments of tension, but mostly Mutrux and Escott are content to tell a simple story that reveals how Presley, Cash, Perkins, and Lewis got started and how Phillips’s coaching and adjustments to their sound catapulted each to stardom. Except for Barry, who gives Perkins some dimension, the acting comes down to trading lines in a casual fashion and being more careful about getting the singers’ posture and voice down than in creating full-fledged characters. This is not meant as a criticism as much as a description of an acting style that seems to work for this show. The characters seems to be trading information rather than having conversations. Barry stands out because his Perkins has less studied and more natural physicality and because the actor seems to put something behind his readings. He alone seems to be talking to others. Hunter gives Elvis Presley a touch of humility, and when the actor looks down, with one lock of hair over his right eye or stands in profile, his resemblance to Presley is striking. 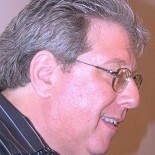 John Countryman is lively and has the best jokes as Lewis. Scott Moreau is a strong, stately Cash. Moreau does a fine job with his part, but you can hear him working at holding Cash’s timbre and accent. Kelly Lamont, dressed beautifully by Jane Greenwood, adds a feminine touch and a woman’s voice to the proceedings. The stand-and-deliver style of acting takes nothing away from “Million Dollar Quartet” and keeps the facts the writers present clear. Famous as the performers represented are, we are less curious to hear their stories than we are eager to listen to their music. 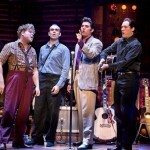 In addition to playing groundbreaking musicians, the cast of “Million Dollar Quartet” have to play their instruments, which means Barry had to get all of the sound and rhythm from his guitar that Carl Perkins did, Hunter has to match Elvis’s basic guitarring while mastering the King’s hip movements, Moreau holds his guitar shoulder high like Cash did, and Countryman has to tear the keys off the Sun studio piano. All of the men do their jobs admirably. They make a fine band that transports their audience to another time where they can witness the birth of something new. One of the problems Mutrux and Escott faced while selecting numbers for “Million Dollar Quartet” is confining themselves to the earliest songs by Cash, Presley, Perkins, and Lewis. Even “Don’t Be Cruel” and “Love Me Tender” come a little too late to be included, so Elvis sings “Memories Are Made of This,” “That’s All Right,” “Hound Dog,” “Long Tall Sally,” and “Peace in the Valley” as well as joining it as a backup for songs by Perkins and Cash. “Blue Suede Shoes,” which rousingly opens the show, becomes an early point of contention because Perkins wrote it and built it to a high position on national crossover charts, but Presley sang it on “The Ed Sullivan Show” and became more identified with the tune than its composer. Tyler K. Hunter sounds like and has the moves of Presley. He can swivel his hips, twist his knee, and thrust his pelvis with dexterity that gets a reaction. James Barry also has Carl Perkins’s quirky leg movements downs while John Countryman aces all of Lewis’s piano bench gymnastics, including hitting some notes with his feet. Scott Moreau makes the most of Johnny Cash’s distinctive voice. He is a vocal match for Cash when he growls out “Folsom Prison Blues” and “Riders in the Sky.” Moreau excites the audience with his rendition of “I Walk the Line” and does a great rendition of Tennessee Ernie Ford’s hit, “Sixteen Tons,” which was out by 1956 but not recorded by Cash until the 1980s. Jamming is the main event, and the “Million Dollar Quartet” troupe, directed by Eric Schaeffer, is game whether someone is soloing or the guys are backing each other up. “Million Dollar Quartet” begins when Perkins is at Sun to record his latest composition, “Matchbox,” and is thwarted in his efforts by a brash young man who wants his chance to break into the music business and agrees to play piano accompaniment for Perkins. The problem is the man is stubborn about playing in his free-wheeling style, which doesn’t fit the clean straightforwardness of Perkins’s song. The pianist is Jerry Lee Lewis, and the impediments he causes during the “Matchbox” recording are never solved. Elvis, whose contract Phillips has sold to RCA for $40,000 he needed to keep Sun a going concern, stops by at Phillip’s request when the mentor learns his most successful protégé is in town. Cash shows up to see Elvis and to talk to Phillips about his upcoming contract. One leitmotif has all of the guys, country boys who feel strongly about religion and found their voices in church pews, arguing with Phillips about recording some spiritual music. Cash is the most insistent. His future with Sun Records will be influenced by whether or not he receives a green light to record some Gospel. Finally the company gets it way with Hunter’s Presley leading them in “Peace in the Valley.” The ensemble almost does a wonderful rendition of “Down By the Riverside,” the song we hear the actual quartet sing on tape near the end of the show. Given the gentlemanly manners of Presley and Cash and the maturity of Perkins, Countryman as an obnoxious Jerry Lee Lewis, a target for Jerry Lewis jokes, is like a fish out of water, a rather large fish, with his crassness and ego. The jam session is more or less continuous, and Corey Kaiser, playing Perkins’s older brother, Jay, on bass, and Patrick Morrow on drums add to the excellent musicianship. Generously, Schaeffer gives them each a solo that shows their artistry. Derek McLane’s set has a feel of a cramped studio that was once an auto parts store. You believe Vince Nappo as Phillips when he says he nailed in every baffle in place by himself. Jane Greenwood’s costumes did better than serve the day. They nailed the looks associated with Cash, Lewis, and Presley and do fine by Carl Perkins as well, The tight purple dress worn by Dyanne is perfect for 1956. Howell Binkley’s lighting is excellent. Kai Harada’s sound design is critical to the success of Mutrux and Escott’s musical. “Million Dollar Quartet” runs through Sunday, June 1, at the DuPont Theatre, 10th and Market Streets, in Wilmington, Delaware. Showtimes are 7:30 p.m. Tuesday through Thursday, 8 p.m. Friday and Saturday, and 2 p.m. Saturday and Sunday. Tickets range from $85 to $20 and can be obtained by calling 302-656=4401 or by going online to www.duponttheatre,com. Although only a few years old in 1956 by the time I was in my teens these guys had proven this prophesy right. Their music was very much a part of my young life and formed the foundation of my passion for it today. This entry was posted on May 31, 2014 by nzoren in Theater Reviews and tagged Carl Perkins, Corey Kaiser, DuPont Theatre, Elvis Presley, James Barry, Jerry Lee Lewis, John Countryman, Johnny Cash, Kelly Lamont, Million Dollar Quartet, musical, Patrick Morrow, Scott Moreau, Sun Records, Tyler K.Hunter, Wilmington.